If you’re looking to deposit with a US poker site using a credit or debit card, you could run into difficulties that have perpetuated since the 90’s. The process has been significantly tightened up since the introduction of the 2006 UIGEA legislation, and other legal precedents have served to make it hard or impossible for banks or credit card companies to knowingly accept gambling transactions. Let’s go through what sites have high acceptance rates and the legality of doing so. It is still relatively simple and legal to deposit at poker (or other online gambling) sites when using a US credit card. It’s been deemed only Federally illegal to partake in gambling if you are operating a site taking bets, or have a processor processing deposits and withdraws. You’re just a player and, therefore, are exempt from Federal issues. 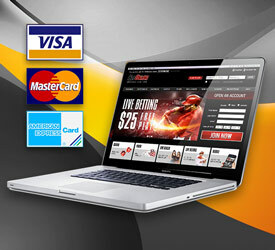 The most effective site that allows credit card deposits – and one that has in excess of 15 backup card processors – is www.Betonline.ag with IgnitionPoker.eu (previously known as Bovada) as an alternative. MasterCard and Visa can be used for deposits at both these poker sites (Amex is also accepted at BetOnline, but you must have at least $250 in your account and have deposited five times using a different method). Approval rates reach between 65% and 85% according to management. This approval rate applies primarily to “secured” credit cards such as prepaid cards, Visa, or MasterCard. Unsecured cards are generally declined, for reasons that we’ve hinted at, and we’ll cover more on that further on this page. In the end, it’s the bank’s decision to accept or decline whichever transaction they perceive as illegal, even if said transaction is perfectly legitimate. 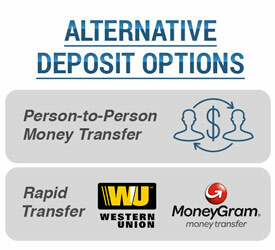 On the other hand, deposits can still be made by using Western Union or MoneyGram. Can You Issue a Chargeback if You Deposit and Lose Your Funds? This does happen every once in a while, but it’s much less common than it used to be. Online gambling sites often limit first time deposits, so if a deposit is successful the first time, sportsbooks will increase the amount they let you deposit. The gambling sites are generally in competition with one another, but this doesn’t prevent them from regularly collaborating and sharing ‘black-booked’ customer names. This sharing is done in order to increase honesty. If you have been black-booked, you probably won’t be allowed to deposit via credit card, and may be banned from the site altogether. Credit Cards at State-Owned Poker Sites? Nevada, New Jersey, Delaware, and Pennsylvania all have legally-regulated and state-licensed online poker rooms. These operate at the intrastate and interstate levels, meaning play is only available inside the state via residents or tourists unless state compacts have been formed like NV, NJ, and DE have done. This means those physically located in New Jersey, Nevada and Delaware can play against one another. 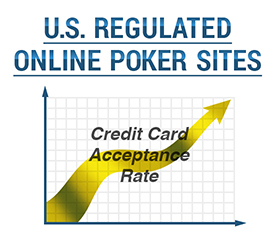 Even with these states having legal poker sites, credit card companies like MasterCard and Visa still decline deposits at times. Online poker market regulations are still in their infancy, and banks are finding it somewhat difficult to differentiate between state-licensed rooms and offshore operators. This has caused many personal cards to be declined. However, as banks come to terms with the legislation, these problems should ease considerably. Each gambling operator within an individual state will be granted a gambling code for processing transactions, which happened on April 17, 2015 in New Jersey and greatly increased credit card depositing acceptance rates. Once the legal markets continue to get set in stone, depositing via credit card will be simple and fully functional. Historically, banks have been keen to limit the use of unsecured credit cards for deposits at gambling institutions. In 1991, a man from Massachusetts had a court rule in his favor that he did not need to pay a credit card bill for a $5,500 cash advance. The money had been spent in a casino, but since gambling debts were unenforceable where he lived, and where the bank was located, he didn’t need to pay back the money. And that isn’t an isolated case. In 1998, not only did another court rule that a woman was not responsible for paying $70,000 she racked up in credit card debt when gambling online, but her attorneys were also successful in winning a counterclaim against MasterCard and Visa. Court cases like those have long had banks looking to refuse the use of unsecured cards at gambling sites. The situation has generally been very different for secured cards, though. That’s because when secured credit is used, no “debt” is said to have been created and so the banks can’t be hit by the same laws. Much of this changed in 2006, however. This was the year when the dreaded UIGEA Act passed into law, making it illegal for banks and financial institutions to “knowingly” process transactions related to “illegal” gambling. (Keep in mind that not all gambling is “illegal” – see our page on poker law.) The penalties for violating this law are hefty, so banks and credit cards companies are much more diligent in policing against online gambling transactions. It’s rare that a bank will close your account for depositing or cashing out gambling winnings, but it does happen. 99 percent of online gamblers have no issues with their banks. Gambling transactions are a nightmare for credit card companies, so don’t be surprised if the bank blocks a transaction to an online gambling site. This is nothing new, and will generally require a phone call to allow the card to process the transaction. Banks face high penalties for not observing the regulations, so they will block any transaction they deem risky. Of course, when talking to your card company or bank, don’t mention that you want to use your card for an online gambling site. Tell them that the purchase is for another purpose. The site may also be able to help you by running your card with a different processor. Sites will use different processors at different times of the day, and may be able to run your card again with a different processor. Where possible, it’s always best to use a secured credit card – one that has been preloaded, or that has been linked to a checking or savings account. If you only have an unsecured card, it’s highly likely you won’t be able to use it to deposit at your desired poker site but there are alternatives. Almost every US poker site offers at least one option that can be used to indirectly fund the account using an unsecured credit card. Take the Rapid Transfer option, for instance. Players use cash or debit or credit cards to fund their Rapid Transfer account. They can then use the Rapid Transfer account itself to move money into a gambling site that supports that form of payment – Ignition Poker, for instance. Rapid Transfer is classed as a person-to-person money transfer service, so payments from it won’t be considered to be gambling transactions, and will therefore, be exempt from the stringent gambling regulations. There are other payments that may also allow you to get around the regulations. When you see other methods, read their descriptions closely, you’ll find that many of them are third-party processors that allow the sites to accept unsecured credit card transactions without there being any risk that the debt will be unenforceable. So, what’s the best solution for depositing online besides credit cards? In our personal opinion, MoneyGram or trusty Western Union, both person-to-person money transfer services, will be your best bets. Other options include bank wires, paper checks, or cashier checks. If you’re a casual gambler, a deposit or two using your credit card is unlikely to be an issue. For those new and looking to deposit online via credit card, we recommend Ignition Poker and BetOnline at this time.